CORR MHÓNA guitarist/vocalist, Paul Quinn, was on the phone with Trevor McCormack for this weeks Cranium Titanium Metal Show on Galway’s Flirt FM. 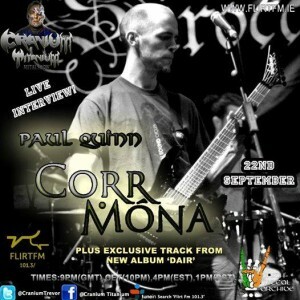 Have a listen below as he talks about the bands upcoming debut album “Dair”. And the challenges involved with being a metal band whose lyrics are entirely in Irish. You can also check out the albums six minute title track, ‘Dair’, in full at the very end of the interview. “Dair” is being launched on the 4th October 2014 in Mr Bradley’s in Cork with fellow Doom titans BRIGANTIA and SOOTHSAYER also added to the bill as support on the night. Door tax on the night will be €6 and the band will also have copies of the album available to buy.